Everyone is invited to cheer on the campus’s Grad Slam semi-finalists as they present their research talks from 1-4 p.m. April 18 in the California Room. UC Merced’s Graduate Division will host its Grad Slam competition on April 18 with graduate scholars presenting on topics ranging from Valley Fever immune response and antibiotic resistance to computer vision and mathematical methods for thermal collection. This year’s competition started in March with 30 graduate students in the qualifying round, from which the judges narrowed the field to the top 12. The systemwide competition showcases and awards the best three-minute research presentations by graduate students. This competition not only highlights the excellence, importance and relevance of graduate scholars and their research, but it is also designed to increase graduate students' communication skills and their capacity to effectively present their work with poise and confidence. Robert Bernstein, M.D., and Jane Binger, Ed.D., support Grad Slam because they know graduate students and their work are integral to UC Merced's mission. Communicating complex research topics to a broad audience in three minutes is no easy task. Fortunately, Grad Slam semi-finalists have UC Merced Foundation Board diplomat Jane Binger, Ed.D., to guide them. For the third consecutive year, Binger is coaching the campus’ semi-finalists and finalist to help them refine their slides and presentation content for the competition. 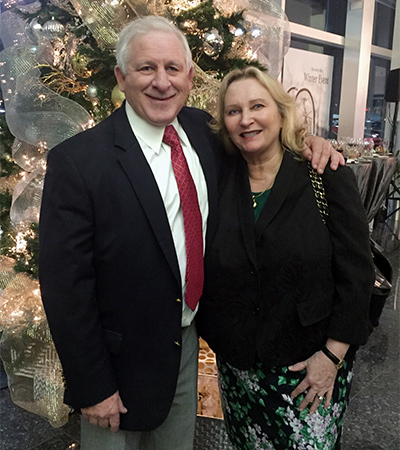 Binger and her husband, Robert Bernstein, M.D., a UC Merced Foundation trustee, made a generous donation to support Grad Slam because they know graduate students and their work are integral to the UC Merced mission. Their gift has increased the competition’s grand prize from $2,000 to $5,000 for five years. Their support has also helped increase graduate student participation in Grad Slam and inspired others to fund the annual event, such as trustee Eileen Hamilton. Hamilton will serve as one of the Grad Slam judges along with UC Merced Foundation trustees Kenni Friedman and John Loll, Ann Anderson, co-vice president of the University Friends Circle, and Kris Kulp, deputy division leader for the Biosciences and Biotechnology Division and the director of the Lawrence Livermore National Laboratory Institutional Postdoc Program. I love helping people go further in their education and careers. It’s something I can give to the students and UC Merced and make a difference. Binger said what she finds most gratifying is working one-on-one with the students to address their personal learning goals and help them develop their leadership skills. Binger passes along what she has learned from teaching leadership to physician researchers and allied health professionals, and what mentors and faculty members have taught her. “I wouldn’t be where I am today without the people who coached me,” she said. While the honor and cash prizes are great incentives, Binger believes the real reward for the students is the opportunity to make research accessible while improving their skillset. 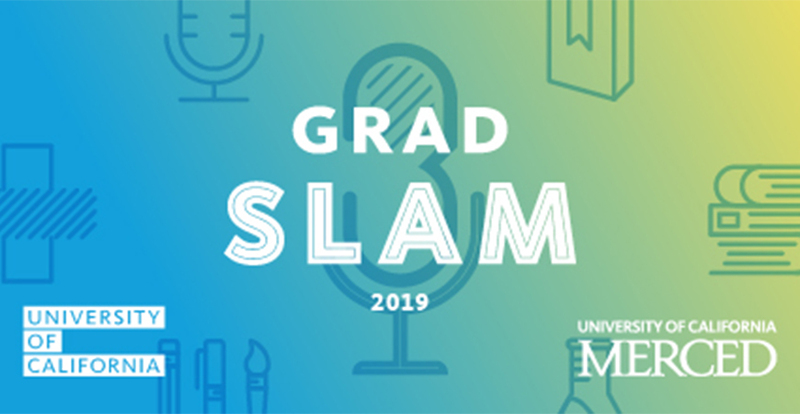 Everyone is invited to cheer on the campus’s Grad Slam semi-finalists from 1-4 p.m. April 18 in the California Room. The winner will represent UC Merced in the UC-wide Grad Slam event in San Francisco on May 10.